The Rev. Doris Green says by the time her husband was diagnosed with prostate cancer it was Stage 4. She says if she’d known he had prostate cancer she would have advocated for him earlier. When Doris Green married an inmate in prison, she knew it was kind of weird, and yet for her it was also normal. As a prison chaplain the Rev. Green says she performed more than 20 weddings between inmates and women on the outside. Green says she eventually fell in love with and decided to marry Michael Smith, inmate N40598. “It’s my time, and I’m gonna do this and here’s your volunteer ID. Take it back,” Green said. She says she knows it was a little scandalous. When Green gave up her work as a prison chaplain she stayed involved in prison issues. She’s currently the director of correctional health and community affairs for the Aids Foundation of Chicago. She helps connect inmates leaving prison with health care on the outside. Because of her job she knows health care workers in the Department of Corrections. But that didn’t make much difference when her husband got sick. The date is December of 1997. Fourteen years before he died of prostate cancer a prison medical record shows he had a high PSA, which is an indicator of prostate cancer. The record says “needs follow up,” but Green says 14 years later her husband died from prostate cancer that hadn’t been treated. 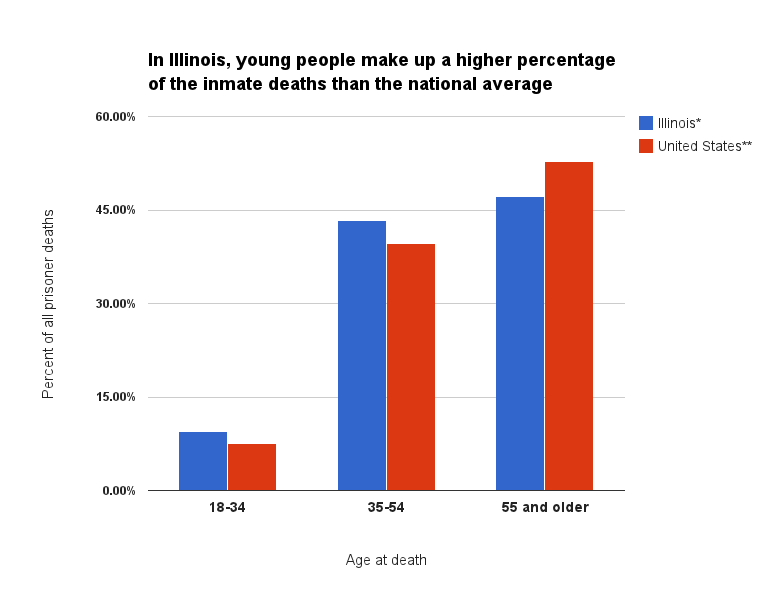 Between 80 and 100 people die each year inside Illinois prisons. WBEZ has sought information about those deaths, but the Department of Corrections under Gov. Pat Quinn is taking a “trust us, nothing to see here” attitude. However, persistent and disturbing complaints from inmates and their families make it hard to just move along. Green says in 2011 her husband was getting up to urinate five times a night and was in extreme pain. That followed a decade of complaints of back pain, noted in the medical record. Green pushed the prison system to get him to a doctor at an outside hospital. “So when the urologist tested him, really gave him the biopsy, it was Stage 4 prostate cancer and bone cancer in his back,” she said. The treating physician says at that point the PSA level had risen from 7.6 in 1997 to 250.6. He says he then prescribed an anti-hormonal injection, but that the Department of Corrections must never have given Smith that injection because the next time he saw Smith the PSA level was 892. He says the cancer should have been diagnosed much earlier. Green says she didn’t find out about that 1997 test with the high PSA level until after her husband’s death. While pushing for medical care for her husband Green says she’d also been asking the governor’s office for compassionate release so her husband could die at home, but that didn’t happen. She says he died in his cell. “And that same day he died I got a call from the governor’s office asking to meet with me about Michael Smith," Green said. "And the receptionist that called me was so, I can feel it in her voice. I felt that I wanted to comfort her in some way. I told her, I said, he just died. And she said, I’m so sorry. C’mon. Too much. Too late. Too much. It’s too late but it’s not too late for those that are in there." The Illinois Department of Corrections strongly disputes Green’s version of events. IDOC spokesman Tom Shaer says privacy laws prevent him from defending the department’s track record in the case of Green’s husband, but, “I can tell you that the claims made by the third party in this case, Ms. Green, are filled with false statements covering the time from inmate Smith’s diagnosis in 1997 and his death 14 years later, after I believe, I’m not sure, she married him while he was in prison. There are many false statements covering that time. I wish I could get into further specifics but I can’t do that. She evidently can. We legally cannot,” he said. The medical director for the Department of Corrections refused to discuss medical care, even in general terms, with WBEZ because of pending litigation. But there are always lawsuits pending. In fact, according to Shaer, there are 4,600 lawsuits against the Department of Corrections right now. Nonetheless, Shaer says citizens should be confident in the health care inside prisons. According to Bureau of Justice statistics, Illinois has one of the lowest inmate death rates in the country. Shaer says that’s proof that Illinois is providing good care. “The total number of deaths, the overall issue with people dying in Illinois prisons is absolutely a non-story,” said Shaer. Reporting on deaths in Illinois prisons will continue throughout the week.